As the summer comes to an end and the fall season is upon us, it’s time to prepare your furnace for winter. There are some things you can do to get ready for winter, but the best solution for furnace repair in Burlington is to contact your local HVAC technician. In any case, it’s always wise to be prepared before that first cold fall night. Change your filters. Filters should be replaced monthly, but if it has been a while since you last changed them, fall is a good time to do so. Clean the area around your furnace. This keeps excess dirt, dust, and debris from getting into your system and helps your filters to last longer. Check your thermostat. Make sure your furnace turns on when you switch it to heat. Check to see that the temperature reading is accurate. Some thermostats even alert you when your filters need replaced or if there are other problems with the system. If you don’t already have a programmable thermostat, this is a great time to have one installed. You can save a lot of energy by programming your thermostat to heat to different temperatures at different times based on your household’s needs. Have your propane or heating oil tank refilled. If you have a propane or oil furnace, the tank needs to be refilled periodically. If you are not already on automatic refills with your fuel supplier, fall is a good time to schedule a refill. Consider getting on a regular delivery plan so that you won’t have to worry about running out or remembering to call for refills. Schedule maintenance. 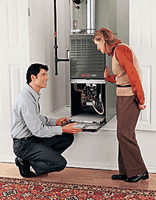 Furnace repair as part of regular maintenance is the best thing you can do for your heating system. If you want to avoid unexpected breakdowns and keep your furnace running efficiently, fall is the best time to schedule a tune-up. To schedule furnace repair in Burlington, fuel delivery, or for other furnace maintenance tips contact Berico at (336)226-9371.